One of my biggest bugbears when it comes to digitizing pencil scratchings is that I have to do my sketching on paper, get my phone out, take a photo – with a black piece of paper underneath to hide the stuff on the other side – then transfer that via bluetooth to my machine, process it through Gimp to get rid of the noise and stuff, despeckle, desaturate and use the threshold command to get the ‘black and white’ levels, mask one over the over to retain the gradient of the pencil or pen, and, finally, use my clumsy mouse for shading and colouring. I’ve been drawing with a mouse since the old 286, and it’s fine and fair enough for this and that but, really, what I’ve been after is a way to draw / sketch / paint directly into the machine. I did a skip around the store, found the present and was about to leave. I looked back. It was still there. “Take me home,” it said, not forcefully, not appealingly, just sagely. 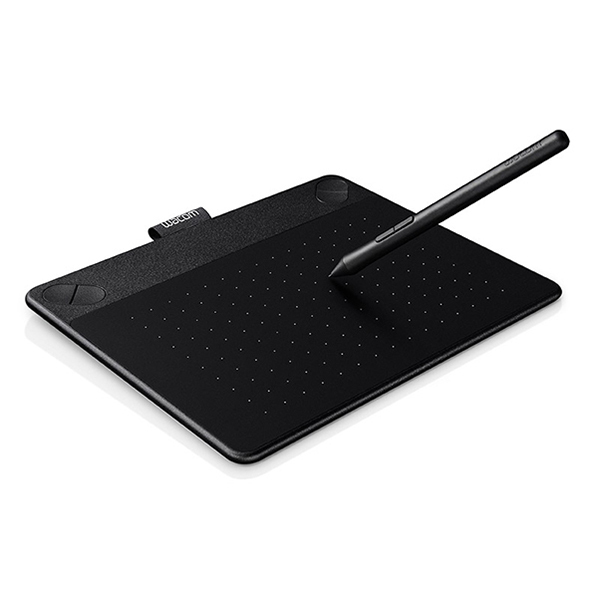 I have an old (ooooold) Wacom pen and tablet thing. As a pointing device, it was great. As a drawing tool, no good. Naturally I was skeptical about this one. But times change, technology improves, things get better, kinks get ironed out. The rest is history. And, I have to say, it’s awesome. It came with a Corel painting software with which it integrates perfectly. It responds to finger pinching, so I can move the virtual ‘paper’ around, or zoom in and out, without having to leave the pad. But the really cool thing is that it’s pressure sensitive, so if I want to make light strokes, the corresponding lines are light. Push down and make darker, stronger strokes. The result is a very natural looking stroke for pens and pencils, even watercolours, oils and acrylics. Blending and shading, as you can imagine, comes out tops. In Gimp, it’s not so great because it doesn’t respect the pressure sensitivity, but pop the picture into Corel and it’s like liquid. I can shade gently, I can shade hard, I can smear this bit, scratch that bit, and even layer it all. Needless to say, I’m going to be spending some time with this little pooch to make the artwork for Grosvenor Lane Ghost. My pictures will have a lot of chiaroscuro, contrasting light and dark, so I’ll be working on shadows and shines a lot, lanterns, old fireplaces, that sort of thing. What do you know? I haven’t been excited by technology for a while. On a side note, I’ve found that this is pretty cool for my little Boy as well: I showed him how to paint with it, how to change the colours and make shapes and things. He’s still getting the hang of it, of course, he hasn’t actually mastered holding a pen properly, but he loves how Daddy can draw him a dragon or a car or a train or a tree or a face or a cat, and he can ‘colour them in’. Bugger. Can’t stick it on the fridge.